Why did both nations begin interfering in the internal affairs of the other during these periods? What were their motivations and aims in their attempts to interfere? Can these two time periods character assist in laying out the relationship between Iran and Iraq? One research reveals that both nations are incredibly crucial to one another and that both nations are at the same time engaged in a conflict against one another. Hence, it can be argued that regarding Iran’s security and economy, as well as its regional role and status Iraq is the most important of Iran’s neighbours; and the same applies from the Iraqi perspective. A large part of the importance of this relationship is regarding the fact that Iran pays more attention to regional rather than global politics (1). Therefore, given that regional politics is the most important aspect of Iranian foreign policy, in this regard Iraq has the most critical status in Iran’s policymaking. So much so, that Iraq is a part of the Iranian national identity regarding religion, behaviour, culture, and worldview; and the same applies from the Iraqi perspective. This argument concludes that one cannot directly attribute the relationship between the two nations, in particular, Iran’s policy towards Iraq, to a single causal factor, such as ideology, supremacy or security, alone. Throughout history, the territory of Iraq has played a significant role and meaning to Iran. History has seen this territory form a part of Iran, become a theatre of Iranian conflict with other nations, and become a territory that poses a severe risk to Iran (2). While this history has fused Iraq and its people with Iran’s national identity, Iraq plays a more significant role in Iranian foreign policy on account of its geography. Iraq, which is a relatively new, wealthy, but unstable state shares the majority of its eastern border with Iran. While this Iraq state is currently undergoing the early phases of its development, Iran has played a significant role in the process of the founding of the Iraqi identity. Iran has influenced the Iraqi identity during its Arab nationalist, Sunni Arab and expansionist periods. What is more, this same Iranian policy can continue to influence a decentralised and weak Iraq in the aftermath of the collapse of the regime of Saddam Hussein. Therefore, if going forward, Iraq chooses to behave as a part of the Arab world or as a Sunni Arab entity, then it will view Iran as ‘the other’. If, on the other hand, Iraq works independently of any collective identity to become a strong international state, then once again it will view Iran as 'the other’. By the term ‘the other’ this research refers to the presence of an international difference, making two nations view each other as enemies and threats. What is more, if Iran is Iraq’s ‘other’, then Iraq has in many historical periods been Iran’s ‘other’, especially after the establishment of Iraq as an independent state. This was evidenced by the difficulty Iran initially had with accepting the new Iraqi state. The instability of the Iraqi state has in many ways presented a threat to Iranian security as it has presented an opportunity to international superpowers to take advantage of the instability to enforce their respective regional agendas. For example, during the Cold War, the Soviet Union took advantage of Iraqi instability, while the United States did so in the post-Cold War era, both of which was to the dissatisfaction of Iran. However, a number of facts may reveal more about the relationship between Iraq and Iran. The majority of the populations of both states live close to the borders of both states, meaning that the majority of Iran’s population lives near the Iraq borders, while the majority of the Iraqi population lives near the Iranian border. This concentration of the population on both sides of the border has made both nations more wary of one another, interns of security threats than they are towards any other of their respective neighbouring states. Moreover, regarding each nation access to natural resources and economic systems, they both rely overwhelmingly on the sale of oil creating a natural rivalry between both nations regarding access to markets and buyers. What is more, they both also have similar economic systems. Even though Iran has tried to distance itself from rentierism to become a producing nation in response to the numerous economic sanctions that the international community has imposed on it, both nations continue to have rentier-state economic models making their economic systems almost identical. This economic reality may provide the foundation in answering the question can Iraq be made to resemble Iran? Such a process of political, demographic, cultural and governmental transformation of Iraq to resemble Iran is a part of the Iranian foreign policy to end the four-century long rivalry that has existed between the two nations. Here, this research can move onto another level of its argument, which is that if Iraq is the most significant nation to Iran in regards to shared borders, rivalry, economic system and conflicting ideologies, then the alteration of these causal factors must become the primary concern of Iran in respect to the preservation of Iran’s national security. Therefore, the rivalry between both states has been in a manner that both have waited for opportune moments to defeat the other and end the four-century long rivalry that has existed between them. For both nations, this opportunity presented itself during 'the others' moment of regime change. According to Abdul-Wahat al-Qasab, the Iraqi aim in attacking Iran was to interfere in Iranian affairs in many ways so that it could secure security and dominance for Iraq in the wider region. Al-Qassab argues that the Iraqi aims were: (1) To prevent the export of the Iranian Revolution to Iraq; (2) To end the Algiers Agreement; (3) to end the Algiers Agreement: (4) to strengthen the internal front; (5) to showcase the ability of the Iraqi army; (6) to make Iraq the dominant regional power; (7) to weaken the Iranian regime; (8) to retrieve previously lost Iraqi land; (9) to defeat the Iranian army; (10) to liberate Khuzistan Province; and (11) to present Iraq as a regional power. These aims reveal the thinking of the Iraqi government, in that they believed that the emergence of Iraq as a regional power was dependent on the weakening and non-existence of Iran as a regional power. Therefore, the Iraqis focused on the methods that they could employ to weaken the Iranian regime, its strength, and its economy to the extent that the threat posed by Iran to Iraq diminished or that Iraq becomes the undisputed dominant regional power (3). Using the same argument in respect to Iranian desires is possible. Where Iraq saw fit the opportunity presented by the fall of the Shah to challenge, attack and weaken Iran, so that it could make itself the dominant regional power, so too Iran saw the fall of the Saddam Hussain regime as the prime moment to challenge Iraqi power through political interference to convert Iraq from enemy to a supplement to Iranian regional hegemony. In this respect, Iran approached the collapse of the Saddam Hussain regime on numerous levels to attempt to change the foundations of the Iraqi state. The Iranian method to change Iraq’s character began with the forced withdrawal of US troops from Iraq and continued with their support for Shi’a hegemony in the country, the formation of a governing system that was characterised by its personalities, its forces, its agencies and its forms of warfare. Both histories once again revealed how important each state was to the other. However, if for Iraq victory over Iran was enough to make it a regional power, the same cannot be said for the Iranians. 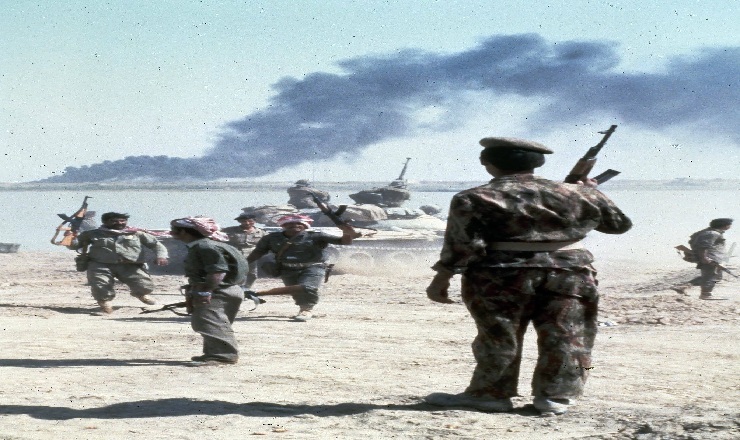 The collapse of Saddam Hussein’s regime was not only an opportunity for Iran to compete for regional dominance, but also for other regional powers, especially Saudi Arabia. Where Saudi Arabia supported the project to strengthen Iraq so that it could once again counter Iranian power, the Iranians had to become concerned with preventing the existence of a new Iraq under Saudi Arabian influence. This Saudi Arabian and Iranian dispute has given way to the current region-wide Sunni-Shia conflict in the Middle East, which like most Islamic sectarian conflict is historically played out on Iraqi soil. Iraq’s vulnerability in this context is due to its position in Islamic history as the place of the emergence of the Sunni-Shia divide. According to Shia literature and the perspective of Iran, the Shia-Sunni conflict is one between the empowered and the not empowered or one between those who have taken power unjustly and those who have had power taken from them unjustly. This perspective serves to demonstrate that the sectarian conflict in Islam is not a rivalry over religious viewpoints but a conflict between two groups over the governance of the religion, which to support their respected positions have established separate interpretations and sects. What is more, while the politicisation of the dispute continues, it has a new veil in recent times. While Iraq is the stage in which the conflict between these two forces to justify their respective positions and to impose their dominance over Islam is played out. The role of territory in this conflict is significant as it is a conflict fought between a minority and a majority population. The question then becomes: how can such geography become so that the minority can become the dominant power within it, and allow it to impose its will over it while being able to continue in its dominance? The answer to this question rests on one of the deep and complex Iranian regional and international policy questions, which is: If Iran is to survive as a state does it require an imperialist model of governance? Alternatively, to what extent is the regional and foreign policy of Iran driven by ideological factors? According to Ramazani ideology and pragmatism have worked together in Iranian regional and international policy-making (4). In the view of this research, the ideological and imperial nature of Iranian regional and foreign policy are interconnected on many levels. It allows Iran to influence the governance of others in a way that serves Irans best interests. Moreover, it also allows Iran to influence the populations of those areas to live their lives in accordance with Iranian values. Therefore, the ideological nature of Iran’s regional and foreign policy is in many respects the same as governance by an imperial system. Of course, given that Iran does not have the means to become an imperial state internationally; its current ambition is to become an imperial state regionally. The roots of these ambitions are deep-rooted, running through Iranian history. First, when Iran views its history, it notes that over time its territory continues to shrink, especially as Iran topography shows that today Iran sits inside a chain of mountains, which if penetrated puts the entire Iranian state at risk. Second, due to its Islamic nature, Iran feels that it is in an isolated position compared to the international system, especially since relations of between it and the United States collapsed in the immediate aftermath of the Islamic Revolution. This position has placed Iran into the category of rogue states in the eyes of the international community. This general categorisation has reduced the international opportunities before Iran, forcing it to focus more on the Middle East region to stamp its presence on the internal community and to protect itself from potential aggressors. However, Takeyh argues that, if Iran is forced to rely on models of imperialism to protect itself, then at the same time this model holds the seeds of future failure for Iran (5). This research was primarily an attempt to discuss the relations between Iran and Iraq via the ring fencing of two unique and significant events, which were the fall of the Shah in Iran and the fall of the Saddam Hussein regime in Iraq. This research was conducted primarily to answer the questions: why did both nations begin interfering in the internal affairs of the other during these periods? Also, what were their motivations and aims in their attempts to interfere? The Iraqi government viewed the collapse of the Shah as an opportune moment to weaken Iran via an attack. The Iraqi government saw such a weakening of Iran a geopolitical shift that would give Iraq hegemony in the Middle East. In the same manner as Iraq, Iran views the collapse of the Saddam Hussain regime as an opportune moment for the Iranian government to intervene in Iraqi affairs to transform it from an enemy state to one that is closely aligned with Iran. With this objective, the Iranians began a multi-level policy towards Iraq to change the foundations of the Iraqi state via the forced withdrawal of US troops from Iraq, and continued with their support for Shi’a hegemony in the country, the formation of a governing system that was characterised by its personal characters, its forces, its agencies and its forms of warfare.